I managed to take a bean burger and add cheese and barbeque sauce to it. Please don’t say you’re surprised. Even since I first made Sarah’s thai veggie burgers a few months back, I’ve been eating them like they’re going out of style baby. #sosogood. I thought it was high time I tried making a few of my own, and I even ADDED BROCCOLI. Behold – the first recipe on this blog that contains broccoli. Behold – the last recipe on this blog that will ever contain broccoli. I have no idea actually. I might have had a recipe back in the day that incorporated some broccoli before I embraced my true hatred for it. THAT was a total stress reliever. But here? You can’t even taste it! How lovely. Let me tell you a little something something: I’m a giant fan of beans. Pretty sure I say that like once a week, but whatever. The truth is I go through nearly a can of chickpeas a day. Freaking love. That’s what that is. I figured that taking a bunch of things I spaz over, like bone suckin’ sauce, caramelized red onions and sharp cheddar cheese… and combining them with chickpeas would solve all life’s problems. Even if they are a little ugly. Plus I threw some extra vegetable-like stuff in there (such as those horrid trees) to trick myself since I’m eternally six years old. Best result ever. And easiest thing ever too. Just throw the ingredients in the food processor and boom – you’re all set. Don’t overprocess as the end result can become mushy. Nobody likes a sandwich full of mush. Oh and puhhhhlease top with extra cheddar. Duh. Heat a small skillet over low heat and add 1/2 teaspoon olive oil. Throw in onions with a pinch of salt, stir to coat, then let cook and caramelize for 5-6 minutes. This should happen fairly quickly since they are chopped small. Remove from heat and set aside. In the bowl of your food processor, add broccoli and carrot, pulsing until chopped very finely. Add chickpeas, sauce, honey, flour, cheese, onions, salt, pepper, paprika and onion powder. Process and pulse until completely combined but not pureed. Carefully remove from processor bowl and form into 4 burgers. If you feel that your burgers and somewhat delicate, refrigerate for about 30 minutes. Heat a large skillet over medium heat and add remaining olive oil. Once hot, add burgers to the skillet and cook on each side until golden brown and crispy on the outsides, about 3-4 minutes. Be gentle when flipping and removing burgers so they don’t crack or fall apart. Serve on toasted buns with additional cheddar, red onion and sauce. Smoky White Bean Chicken Chili. 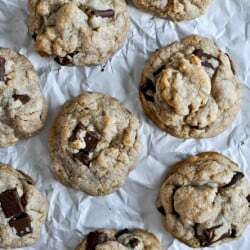 Brown Butter Oatmeal Chunk Cookies. These came together really easily and tasted great. Next time I may add a little extra flour because they were still a bit mushy inside after cooking. This is definitely a keeper though. Thanks for the recipe! Is the broccoli cooked or raw?